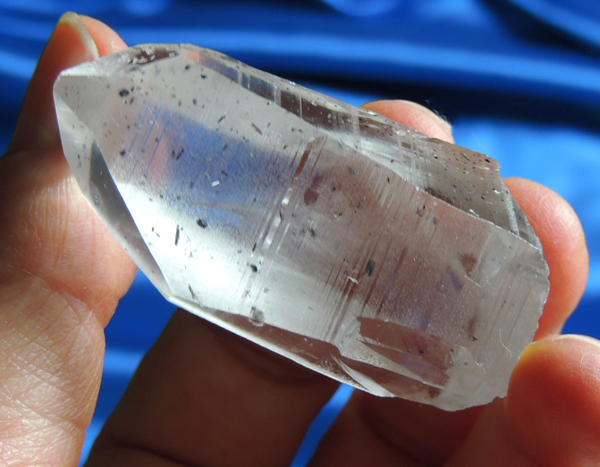 This is a cute, pocket-sized 1.1 oz and 1.95” by 0.9” by 0.8” Lemurian quartz with quite profound lines and slanted and healed base. She is prismatically clear with almost has a grayish cast to her … study her with a loupe and you’ll see tiny bits of specular hematite as well as a number of well-shaped hematite crystals within her. Every other side is with exceedingly minute Ursa Minor starbrary glyphs, making those sides appear matte but they are as lustrous as the others. She has a large ding to one side that is totally healed (albeit recently as it still has a gloss to it) but she is otherwise in excellent condition and ready to go to work!